Rural communities in the past were often impractical to visit without a car. You could hire a driver in Santa Fe to bring you up here, or get a shuttle to Chama that could drop you off in Abiquiu, but the rates were expensive, and the times limited what you could do once you were here. Blue Bus has changed all that and opened up our small communities to a new breed of tourist. I was so happy when I realized I'd be able to take public transit to Abiquiu! I don't drive, which does make it hard to get to some places I'd like to visit. 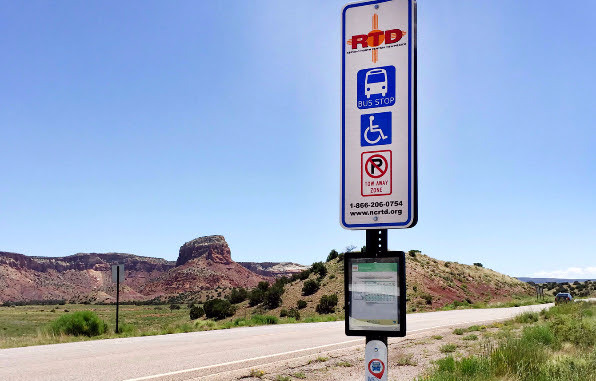 I have been telling everyone in Chicago that the bus system in New Mexico is really very good, and showing them a picture I took of the bus stop at Ghost Ranch, which must be one of the most beautiful bus stops in the world. It took about half a day to make the trip. I caught the 5 am Rail Runner train to Santa Fe, which took about 2 hours, and then I had just enough time to grab a donut and a cup of coffee there before catching the 7:47 Park and Ride bus to Espanola (that was the 2$). I got to Espanola at 8:45 am, and then I had to wait for the 10:20 Blue Bus to Abiquiu, which got me there around 11am. That comes to about 6 hours travel time, which isn't very fast, but I enjoy reading on the bus and watching the scenery go by so I didn't mind at all. It could probably be done faster, if someone was more careful about making the connections quickly. I did a lot of walking in Abiquiu! Orolynn lent me her bicycle, which was wonderful for getting around town. I rode to Santa Fe National Forest and to Plaza Blanca (I was glad to have a mountain bike on that road, it was rough going! I almost brought my own bike from Chicago, but it would have to be checked on the train and would have been too expensive. Probably for the best, as it's a road bike and not so well suited for unpaved roads. It is nice to know that I could have, though- I learned you can put a bike on the rail runner and both bus lines I rode!). 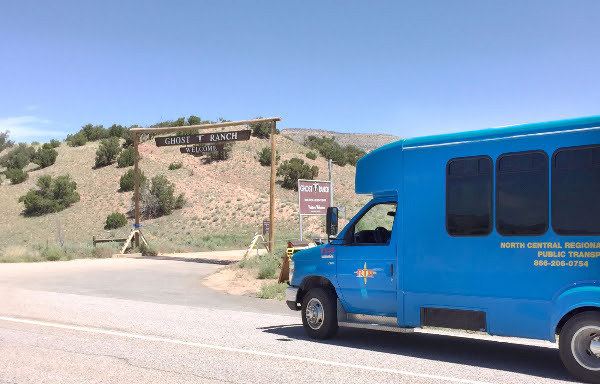 I rode the Blue Bus to Ghost Ranch, and spent all day hiking there (I hiked the Kitchen Mesa trail, which was amazing, but I was really sore the next day!) before taking the evening bus back again. I hope I can come back again soon! I had a wonderful time and I am sure there is so much more to see. I have been telling all my friends about Abiquiu and New Mexico and how beautiful it is. Blue Bus has been invaluable in providing transportation for locals but it also opens our communities to tourists previously unable to visit. If you list your vacation rental with Abiquiu News, VRBO or Airbnb you might consider having a couple of bikes available and publicizing that you can get here without a car! Use the Blue Bus Tracker online, or on your iPhone to view routes and track the next blue bus.